Fans of the Monsoon Cup didn’t have to wait long for the first major upset of the regatta, when in Match 1 of Flight 1 in Qualifying, local sailor Hazwan Dermawan beat Australia’s Keith Swinton on Malaysian home waters. 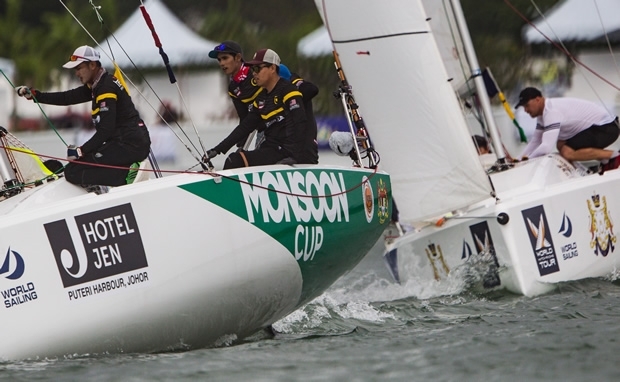 The last time the 27-year-old amateur managed to qualify for the Monsoon Cup was 2009, yet Hazwan showed no fear as he overtook Swinton on the downwind leg when he found more wind to the left of the Aussie boat. Swinton and his crew on Black Swan Racing kept the fight tight with the Malaysian crew on Team Pulse-AC Law. When the Malaysians trawled the gennaker in the water on the final hoist to the finish, Swinton took his opportunity to pounce, trying to overtake to the downwind side of Hazwan’s slowed-boat, but the Malaysian kept his cool as the crew recovered the soggy sail and successfully hoisted it to sail away to a famous victory. Having tasted success, Hazwan is raising his ambitions, targeting more victories against his 11 rival international teams competing in this, the finale of the 2015 World Match Racing Tour. “Today we beat our expectations, just winning one match, but tomorrow or maybe the day after we can win two more, maybe against Johnie Berntsson,” grinned Hazwan, looking across at the experienced Swede at the after-race press conference. Berntsson smiled with a “Why me?” look of bemusement. While the skipper of Berntsson Sailing Team also holds down a job outside sailing, he’s no pushover. Asked to give his view of the Kiwi crew’s handling error that handed him victory, Williams pointed out in good humour: “If he sails like that he won’t have a job for very long, that’s for sure!” Whether the teams will be so jocular with each other as we reach the business end of the regatta, we’ll have to see. With a world title, a share of the MYR 1,475,000 of event prize money plus $80,000 of winners Tour Bonus up for grabs, this is serious business for these professional teams. Although he has yet to race, Joachim Aschenbrenner finds himself at the bottom of the leaderboard with a -1 score to his name. The Danish skipper was penalised for cleaning his rudder, inadvertently breaking the rule that disallows crews from cleaning the boat or equipment below the waterline. It’s a harsh lesson for the 21-year-old, but the competitors in a World Championship are not forgiven such basic oversights of the racing rules. Even so, Aschenbrenner is requesting a reopening of the hearing this evening. As for today, though, it was a victory for the part-time amateurs from Malaysia that makes the headlines. It has set the stage for a competition that is bound to see many more twists and turns before we find out who wins the World Match Racing Tour.